On April 8, 2019 ESBC will update their Blockchain, if you have not updated your wallet go runing and do it!, i leave you here my article where we explore a little of the new version 2.1.0.1 and the elegant new design. To better understand the “why” of this update, read the main article “Update of the ESBC Blockchain”, we will also analyze it here. The need to update the protocol comes mainly from the distribution based on the reward for the current block, but what does this mean? 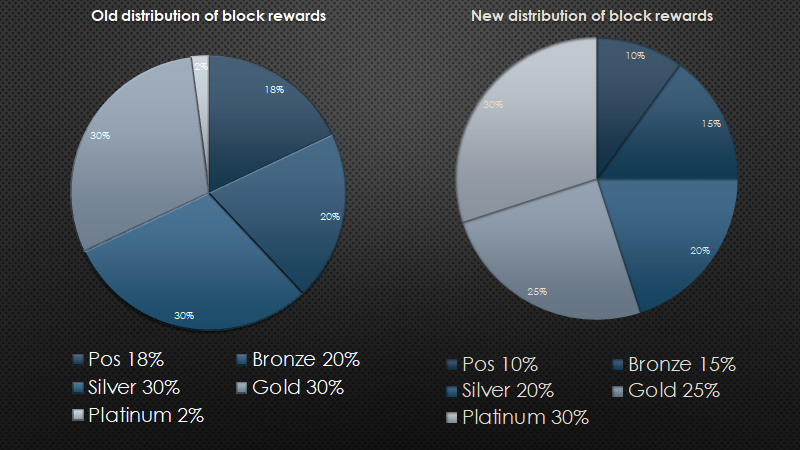 mmm back to the week of March 24 where the team launch the first MN Platinum level with a 2% in the rewards for the block, that don’t looks very attractive in profit knowing activating 5 Gold you can get more coins. 1. To achieve a greater number of blocked coins in order to look even more attractive on the Masternodes market. 2. To reduce total emission — ESBC will become more reliable for traders. 3. Reduce the reward for PoS. With the activation of the protocol, the average time to generate new blocks will increase, by +10 seconds in each week, until it reaches an average value of 120 seconds, 6 weeks after the activation of the protocol. Remember that the current average time is 60 seconds, this gives us a total of 6 weeks of transition to reach the maximum point of this update (120 seconds), which we will be documenting in the next articles creating a series of “6 Articles” where we will dedicate one per week, describing the experience and summary on the Masternode side. Several MN Gold owners will upgrade to platinum. Several owners of MN Silver will upgrade to Gold. Many who kept doing PoS moved to bronze or to the other differents levels. This will give way to a restructuring at all levels in search of the best profit, also increase the demand and more things that we will see in the next articles. If I have an active Masternode, should I do something? With all this information you are ready for this new update, do not miss the new articles in this series !!! Download the new version of the Wallet 2.1.0.1 ESBC!!!!!! !